Our proprietary technology automatically captures data from your practice management software and uploads the data to our website based on a schedule established by the practice or hospital during installation. Your horse owners will be able to safely access their horses medical records 24 hrs a day and will also be able to request appointments and prescription refills. A library of horse health articles, horse health videos and an interactive horse are also available in this powerful tool. How much time does it take to upload data? Our process is fast, typically a few seconds to several minutes, depending on the size of your database, your system capability and the speed of your connection. EquiHealth information resides on our secure server protected by a firewall. Only the horse owner (or anyone with whom they choose to share their Login and Password) can see their horses information. There is no update capability on-line. Does EquiHealth require a practice staff member to manage the process? No. EquiHealth operates unattended. The veterinarian provider simply continues to use their practice management software as intended. Once EquiHealth has been installed the extraction and upload process operates automatically. Does EquiHealth replace a veterinary practice management software? No. EquiHealth serves as an enhancement to your existing software. Can the horse owner or veterinarian update records on the EquiHealth website? No. We provide display only. All information is updated through your practice management software. Is a practice required to have a web site to use EquiHealth? No. EquiHealth operates independent of any other website. What if my practice already has a website? EquiHealth can be integrated into your practices existing website or a hyperlink can be added so clients can continue to visit your website. 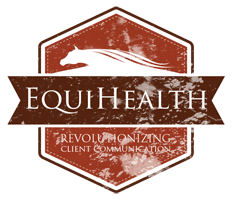 We are not interested in replacing your website; EquiHealth is meant to enhance your existing web presence. Can my clients print important health information about their horse? Yes. EquiHealth allows your client to print horse id cards, horse health articles, information about their horses medical records and much more. What operating systems work with EquiHealth? Your practice computer must be capable of running MS Windows XP or above. There are no operating system requirements for clients who are browsing their EquiHealth on your site. Visitors need to simply be running an up to date internet browser (Chrome, Internet Explorer, Safari, Firefox, etc.) to enjoy the many benefits of EquiHealth! What is required of my business computer system? Your computer system will need to remain on in order for our upload process to be successful. It is not necessary to login to your practice management system during our extraction and upload process. We recommend a high-speed connection (Cable, DSL, T1). The EquiHealth upload process is fast but as with any Internet process, a faster connection improves the processing time, especially if your client database is large. EquiHealth works well with Chrome, Internet Explorer, Firefox and Safari at a resolution of 800 x 600 or higher. It also works on most wireless devices with internet capability. Why are there two different logins Horse Owner Login and Provider Login? Horse Owner login is for horse owners and displays their horses medical information and provides access to educational materials. Provider login is only for the practice or hospital that wants to query their practices records or access our Marketing tools. As a Horse Owner how do I view my EquiHealth? To view your horses medical records login to our website with your email address and your private password. If you have multiple horses you will be able to view all your horses after logging in. As a Veterinarian provider how do I view my practices EquiHealth? To view your practices medical records login to our website with your user name, issued by EquiHealth, and your private password. You can search for a specific patient by entering the the horses first name or the horse owner's first or last name. The first login of a horse owner or veterinarian provider requires a new private password to be created. This private password should be recorded and kept secure. If the password is lost or forgotten contact us by clicking on 'forgot password?' and we will email you the password. How is EquiHealth helpful to an Emergency Center? If a horse requires medical attention when away from their normal veterinary provider, the horse owner can login to EquiHealth and the Emergency Center can use the medical information to diagnose or treat their animal. How can I sign up for EquiHealth Service? As a horse owner you must contact your primary veterinarian and request membership. How much does EquiHealth cost? What is the enrollment and implementation process? What is the process for Dashboard installation ? We will be installing the EquiHealth dashboard during this initial call. This is the software that communicates directly with your practice management system and allows you to choose the data you wish to display on the EquiHealth portal. The specialist will also help configure other dashboard features including when you prefer data to be transmitted to EquiHealth. WebEx is used for trainings and can be accessed at https://pattersonsupport.webex.com. What is the process for Portal training ?